Gyoza are an awful lot of tasty in one cute little wrapper. They are a great little appetizer before sushi and they make great wonton soup! Like most of these asian tiny tidbits I tend to make a bunch of them sitting in front of a movie to be frozen and enjoyed at another time. Worth it and very fun! I made a few with different shapes for the picture. I have a preference but really it doesn’t matter how you stuff them, they taste great either way. Go for whatever you like the looks of! Mix all of the ingredients in a bowl except for the wonton wrappers. Mix well, I tend to end up using my hands to get it really well mixed. To assemble: Place the wonton on a flat surface so that it makes a diamond, Wet the sides with a bit of water on your fingers. Place a tsp. of the mix in the center of the wonton. Fold the diamond in half so that it forms a triangle and pinch the sides closed. You can vary your sealing method, I just use this as it is fastest for when I am making a ton of these. Freeze them on sheets before putting them altogether in a tub. 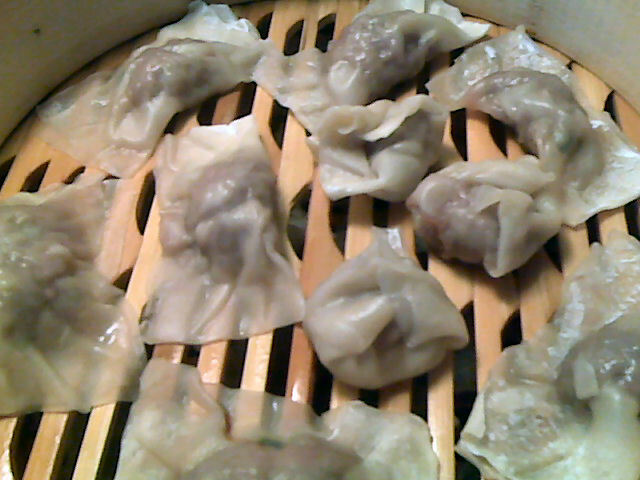 To cook: steam in either a bamboo steamer or other steamer for 14 minutes from frozen, less if they are fresh. You can also pan fry them for about 5 minutes in a bit of canola oil. This will add fat to the dish though, remember to count it! Makes about 48 wontons. Each wonton is 52 calories, 2.1 grams of fat, and 0.2 grams of fiber. I like to serve them with a bit of ponzu sauce or sometimes a bit of soy sauce mixed with rice wine vinegar and red pepper flakes. This entry was posted in Ingredient, Sidedish, Snack and tagged Beef, Pork. Bookmark the permalink.